Creative Think: The Greatest Relay Race Ever! Being the swimming aficionado you are...can you please list a few reasons why world records are being broken ('smashed') in seemingly ever other swimming event? I'm a big track and field fan, where WRs actually means something, as there are only a handful set every five years. 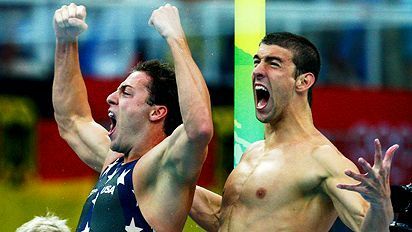 1) Every elite swimmer on the planet knows that in an Olympic year, he or she will train very hard and have a focus on two key meets: their nation's trials and the Olympics themselves. 2) As more money is available to the sport, more and more of the elite athletes prolong their careers. Since performance clauses are often part of their contracts, they are motivated to train at a high level. 3) More ideas are being discovered about effective stroke technique. 4) Strength training and supplements. Just about every athlete takes some kind of protein and/or strength building supplement (which are legal). 5) Much has been written about the Speedo LZR suit. It does seem to have a "streamlining" effect on the athletes. 6) Movement away from the "one approach fits all" relationship between coach and swimmers, and much more toward very customized coaching with individual swimmers. It was a fantastic performance and great entertainment. But can it teach us anything about creativity? Please take a look at my blog posting where I argue that sport in general can teach us about execution and motivation but not much about creativity or innovation. Thanks for your thoughtful comments. I'm of two minds about your comment. Part of me says that, yes, sports is entertainment and what else does it relate to? With respect to my post about the 4 x 100 relay: There are many innovations present in the competition: beginning with different stroke technique (compared with even three Olympiads ago) to different push-off techniques (notice how long Phelps -- and the now the others -- are staying underwater doing dolphin kicks) to the design of the LZR swim suits and the design for pool (wave-deadening gutters and lane lines and deep water). For me, though, the key thing in innovation is execution. You can have the greatest idea in the world, but if you can't get it into action, then it's worth considerably less. Over my lifetime, I've had a lot of ideas, but the ones that have really made a difference were the ones that I had to fight had for to make happen. Sometimes when I thought I was down, I'd find the energy to make make more sales call or contact one more person. And sometimes I'd get lucky. Perhaps it's projection on my part, but I could identify with the pluck of the winners of that relay. I'll never forget your comment about the effect of silicon application to swim goggle manufacture and resultant increased "pain free" (eyes anyway) training time from the first edition of your book!! I've used it innumerable times to illustrate the power of looking beyond the apparant focused study area for applications from other disciplines - and it still works!! To be successful means to reach the A+ level and for that, students need to present the good quality buying essays papers. But is that possible to write it without an aid of the assignment writing service? Sure, it is workable, but it will be easier to order essays about this good post in Internet. 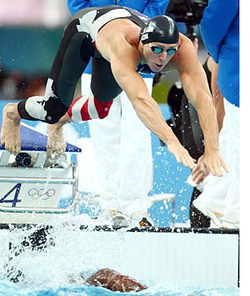 I like Jason Lezak , it`s one of the best. You a such good person, you tell us about, really very informative for us and for gathering knowledge, Thanks!